1. Apply Lancôme Galatéis Douceur in light strokes working from the centre of the face outwards (forehead, cheeks, chin), then finish on the T-zone and under the chin. 2. Remove any residue with a tissue. 3. To complete your makeup removal, follow with Tonique Douceur. But I use a cotton pad to wipe out excess of mascara under my eyes after washing it with a face wash and water. The strong Lancôme Galatéis Douceur fragrance in serums and moisturisers is not continued in this product. Lancôme Galatéis Douceur scent is very slight one. Lancôme Galatéis Douceur leaves my skin soft, hydrated, and avoids it becoming greasy. It works very well for my sensitive skin, leaving it glowing, refreshed, clean and without causing irritation. It removes even resilient make-up and its gentle formula allows it to be used to remove eye make-up. The only downside is the white, non-transparent bottle, you never see how much of the product is left. But overall, the functionality of the bottle is not too bad, as it keeps bacteria out with its hygienic pump. 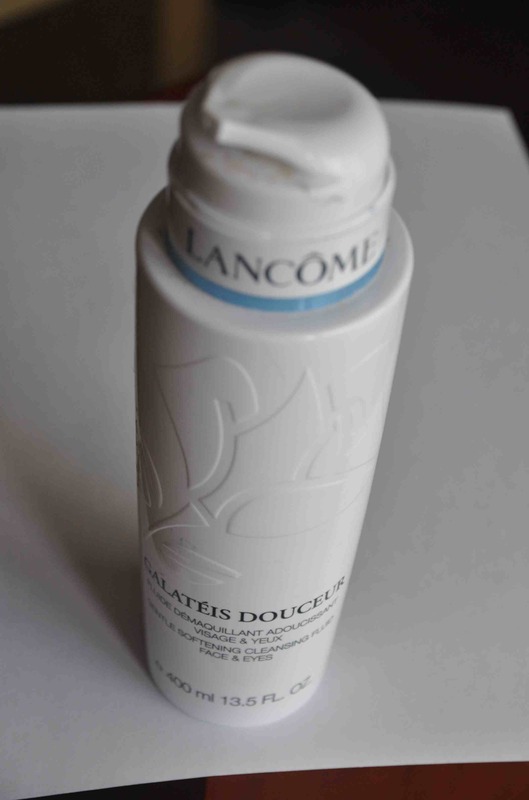 Lancome Galateis Douceur Cleanser is a water-light lotion for fast, thorough cleaning. I have an oily which is actually caused by it being dehydrated. It has a very slight, pleasant scent. Give it a try. This entry was posted in Cleansers, Face care, Lancome and tagged cleanser, cleanser milk, cleanser milk to sensitive skin, hydrating cleanser milk, Lancome, sensitive skin cleanser, skuteczne mleczko, the best cleanser, the best of Lancome.